Almonds contain protein, vitamin E, magnesium, and phosphorous. Phosphorus plays a significant role in helping your body use carbohydrates and fats. It also aids the body to make protein for cellular activity. Because they have high calorie content, almonds should be consumed in moderation. Half a cup serving is enough to help you build lean muscles. Pork tenderloin contains low fat, high protein, B vitamins, and selenium. A 56-gram serving of lean pork tenderloin can provide you with the protein essential in your bodybuilding diet. The B vitamins in pork tenderloin also help convert food into energy while B-12 helps in the formation of red blood cells and nerve functions. Buckwheat is famous around health enthusiast circles because of its vitamin and mineral content. It’s a rich source of B vitamins, magnesium, manganese, and phosphorus, which are helpful for the body’s muscle building process. Buckwheat is also a good source of gluten-free fiber and carbohydrates that are essential in building muscle. 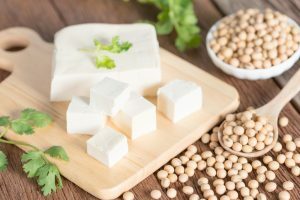 Tofu comes from soy milk and is a good source of protein. Vegans use tofu as a substitute for meat. It’s also rich in calcium, which is essential in muscle functions and bone health, and iron, potassium, and manganese that help build muscles. Chickpeas or garbanzo beans are a good source of carbohydrates and protein. Though the protein in chickpeas couldn’t match the protein found in animal sources, it’s still one of the best sources of protein for vegans who want to build muscles. Scallops are a rich source of protein with fewer calories. They’re the best choice when you want protein with no fats while building muscles. Like milk, cheese contains calcium, potassium, manganese, and vitamins A and B, which are all essential in body building. But some people don’t prefer cheese because of its high sodium content. Quinoa is a rich source of complex carbohydrates, which serves as fuel to provide energy. It also offers complete protein, fiber, antioxidants, and minerals. Quinoa is a good post workout food that can help repair, rebuild, and protect the muscles. Edamame is immature soybean found in pods and served mostly in Asian cuisines. It contains protein, fiber, folate, vitamin K, and manganese. One of the important functions of folate is to help the body process amino acids, which are the building blocks of protein. Banana is rich in potassium, which can replenish and rejuvenate the muscles after a workout. Banana is also rich in calories and could make a perfect addition to your smoothies and snacks before or after a workout. Brown rice contains only a small amount of protein but is a rich source of carbohydrates, which can help the body stay physically active. Similar to quinoa, brown rice is a healthy carbohydrate that aids you in intense training and exercises while building your muscles. Aside from their high protein contents, broccoli and spinach are a rich source of calcium and vitamins B and C. These veggies are necessary for building muscles because they help promote fat loss and aids in muscle growth and muscle recovery. They also provide folic acid, necessary in DNA repair and the production of red blood cells. If you’re a vegetarian looking to build muscles, pulses can help you provide your protein needs. Chickpeas, pigeon pea, and soybeans are among the best sources of vegan protein. They’re very effective as a post workout meal. Milk is a rich source of carbohydrates, proteins, and fats. It contains slow digesting proteins that aid in muscle growth. When combined with weight training, milk is very effective in building muscle mass. Peanuts contain carbohydrates, protein, fats, and amino acids. Due to its high protein contents, peanuts are recommended to be paired with exercises that tax the muscles, like weightlifting and pushups. Eating nuts post workout helps muscle growth. Like cheese, yogurt can be a healthy snack when you’re starting to build muscles. It’s rich in potassium, calcium, and protein. Yogurt is even better than cheese because of its low sodium content. While dieters shy away from potatoes because of its high calorie content, bodybuilders love it. The calories in potatoes promote muscle development and help support a large body size. Potatoes are a good addition to your diet while building your muscles. They have no fat contents and are rich in calories and carbohydrates. If you prefer less calorie intake, you can bake potatoes or prepare it with less oil. If you’re looking for high quality protein, grab an egg. It’s packed with healthy nutrients like healthy fats, B vitamins, riboflavin, folate, iron, phosphorus, zinc, and choline; all of which can provide your body with the essential nutrients you need. It’s also a rich source of leucine, an amino acid that promotes muscle growth. Salmon is not only a good source of omega-3 fatty acids for your overall health but also of protein. These two nutrients are equally important in building and repairing muscle tissues. Other nutrients found in salmon include vitamin D, B12, niacin, and selenium. Like salmon, tuna is a rich source of omega-3 fatty acids, which are good for heart and muscle health. It’s low in fat and rich in lean protein. A five-ounce canned tuna has the same protein content with a five-ounce roasted chicken. And canned tuna is easier to grab than some other protein-rich sources. If you want something that is low in fat and calories but high in protein content, shrimp got your back. With almost pure protein content, shrimp has zero carbs. Additionally, shrimp contains leucine, the amino acid that promotes optimal muscle growth.